Just days after Disney Princess and the Frog necklaces were recalled for containing the heavy metal cadmium, another Disney branded jewelry line is being recalled for lead, the U.S. Consumer Product Safety Commission said. 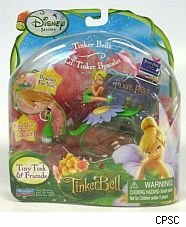 This time it's charms sold with Tiny Tink and Friends Children's Toy Jewelry Sets. More than 250,000 sets contain excessive levels of lead including Tinker Bell's Lil' Tinker Bracelet, Rosetta's Rosebud Key Chain and Silvermist's Water Lily Necklace. A metal connector that links the charm to a necklace, bracelet or keychain is the part that contains lead. Sets with plastic rather than metal connectors are not subject to the recall. The Chinese-made toys were imported by Playmates Toys and sold nationwide from November 2008 through November 2009 for $6 to $8. "Once we became aware of this incident we filed a report with the Consumer Product Safety Commission and took immediate action to stop all sales of the product in the U.S.," Playmates Toys said on its Web site. "We are working with our customers to dispose of inventory held by them and replacing the affected charm for consumers." Playmates said 108,000 sets were sold. Lead can be toxic to young children when ingested and has been linked to long-term health effects, including brain damage. If you have one of the recalled sets you are asked to discard the cord and charm and contact Playmates Toys to receive a replacement charm accessory. For additional information, call Playmates at (888) 810-1133 weekdays between noon and 8 p.m. Eastern Time or visit the company's Web site. The CPSC said it was alerted to the problem by the California Attorney General's office.